What I love- How the flowers came out! So when I got a request for a Tu Bishvat Bar Mitzvah cake with flowers I knew I would not be going for traditional. The color scheme on this cake is just beautiful. 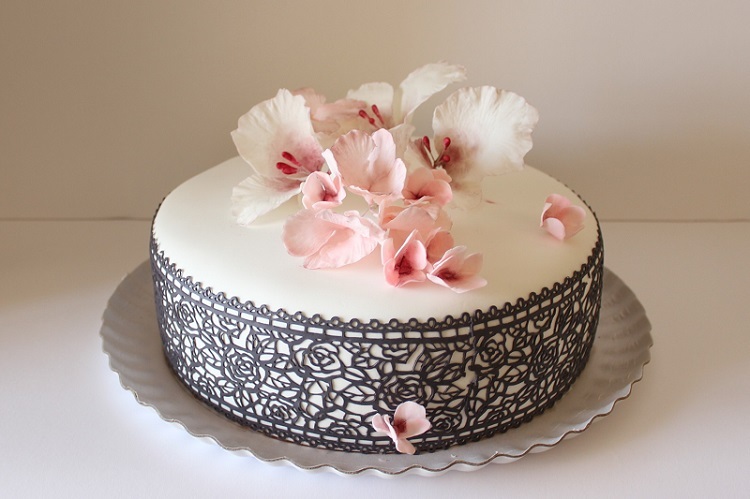 Using black, white, silver and a touch of pink I created an “Almond Flower” cake AKA a “Shkedia”.I actually stopped by an almond tree and examined its flowers up close so I could get a real feel for them. They are very delicate and have a texture like fine fabric. So what is the secret you ask? How do I create such realistic flowers? It boils down to two main factors. 1. Thin and Ruffled! Its all about the thickness of the sugarpaste – I roll it super thin (win your own professional rolling pin in our February giveaway!) to duplicate what actual flower petals look like. I want to make sure the flowers dont have an artificial modeling clay look. 2. Color Color Color! Shading and depth. When creating the illusion of depth, I start by heavily dusting the center of the flower and slowly work outwards using less color as I go. Having a picture of the flower in front of me really helps. Getting a real flower is even better! A steady hand and an understanding of color and shading plays a real part here. Take notice that the edges of the petals are slightly dusted as well, most flower petals have that effect. My goal here is to get as close as I can to the real deal. Sometimes I am amazed at what difference a drop of dusting does, and what a tremendous significance it has to achieve that natural look. And finally the black lace really gives it a nice finishing touch! Happy to answer your questions – just leave them in the comments below. Have a great flower filled week!